For Ultrasonic Hatch Cover Testing we use a model which is type approved by ABS Class and also approved for use by the insurance companies British Marine and North of England. The main pieces of the unit are the transmitter (the device with a dome on the right) and the receiver (on the left). 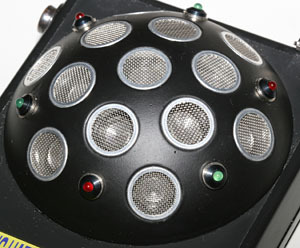 The level of ultrasonic sound emitted from the transmitter is displayed on the receiver's digital display in decibels. 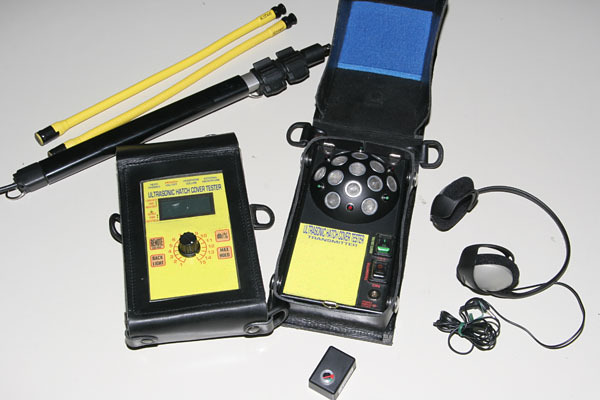 For the convenience of the operator one of the yellow microphones is connected to an extending 1.2m inspection shaft. 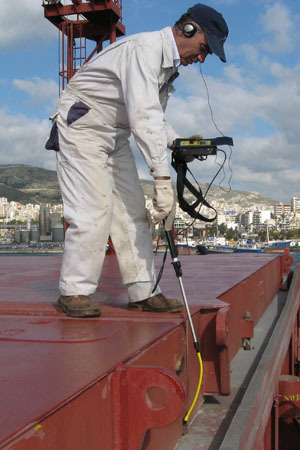 Therefore the operator can comfortably inspect the hatch covers for a long period while maintaining the microphone at a close distance to the area being inspected. The transmitter has 13 Ultrasonic emitters which is the most in the industry and offers the best dispersion pattern to ensure that the most sound energy reaches the hatch covers. They emit ultrasonic sound at 157 decibels which is slightly louder than an airplane jet engine. The transmitter not only makes a sound sequence that indicates whether it is in operation, standby or low battery condition but also does the same with green and red flashing led lights. It is important for us to verify that the unit is kept in correct working order. 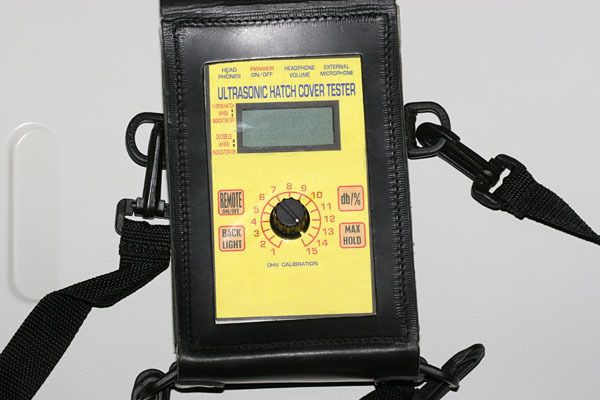 For this purpose we have an ultrasonic emitter tester which is shown above. This enables us to verify that each of the 13 ultrasonic emitters in turn are actually emitting at full strength. Additionally we have the digital readout of the receiver that will give us a reading of 157 decibels at close range to the transmitter. Therefore it is easy for us to know whether the unit requires servicing or calibration and ensure that we are using a unit performing to specification when we are doing an inspection. The receiver is contained in a case which has two straps, enabling the operator to have the unit in a position where the digital display can be easily read. The ultrasonic sound is not only displayed in decibels but the operator can hear the changes in the level of sound received with the headphones. The powering of the system is very convenient as it is powered by rechargeable NimH AA and 9V batteries. We provide the operator with two sets of rechargeable batteries which will power the transmitter for 8 hours in total and the receiver for 80 hours in total. Furthermore the transmitter can be powered by an external battery pack if required allowing very long inspections. In order to extend the battery performance of the transmitter it can conveniently be placed into standby remotely using a button on the receiver thereby avoiding keeping the transmitter working while actual hatch cover tightness testing is not taking place. In order that the operator does not mistakenly continue the inspection whilst the transmitter is in standby, the ultrasonic audio changes into a different sequence therefore it is easy to hear on the headphones the status of the transmitter. We conduct our own in house training of our operators. 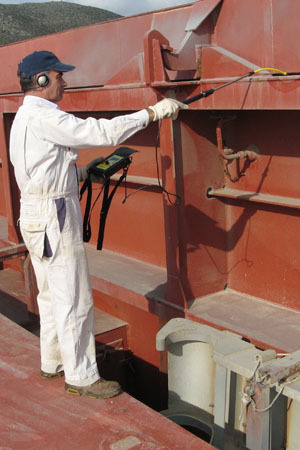 If you are interested to purchase a Cargo Safe Hatch Cover Testing system then please contact us. We ship worldwide. We would also be pleased to demonstrate the system to you at our offices. The unit is priced much lower than competing products and would be very useful also for Superintendents, not only for Surveyors.